We kept electrical power, which was the most important commodity other than food during that first 24 hours of the paralysis that had hit our city. There were countless stories of fires and losses of life and car accidents, and late Wednesday afternoon, I decided that I needed to walk back up to Shades Crest Road to check on my van. I had a feeling I wouldn't like what I found, even though I'd left it in good shape. Nick walked with me, and on the way, we passed lots of wrecked cars. In some places, it looked like someone had just picked up a handful of Matchbox cars and just dropped them randomly in a pile on the street. So bizarre. I mean, these are the streets in our neighborhood, streets that we drive every day on the way to and from work. This is three blocks from our house. As we got closer to Shades Crest again, vehicles were parked on both sides of the road. People had pulled OFF of Shades Crest the day before, either to get out of the way or to try an alternate route. Unable to go any farther, they just stopped here. As Nick and I hit the corner of Shades Crest, it looked even worse than it had the previous day -- except the snow had stopped. No cars were moving ... cars were just sitting. Everywhere. Empty. It was like a ghost town. I mean, is that picture below eerie or WHAT. What I knew for sure when I turned and looked back up the hill was that there were a lot more cars up there than there had been when I'd left my van up there the day before. And it looked PARTICULARLY more crowded in the exact spot around my van than I wanted it to. I said as much to Nick. When we reached my van, I saw that a Honda Element had slid into it, and then four more cars had followed it down the hill. The person who'd hit me was nice enough to leave her name and phone number on her windshield. Honest drivers for the win! And luckily when I parked I'd put my emergency brake on, or we might have all gone sliding down into these other cars. The damage to my van isn't bad ... 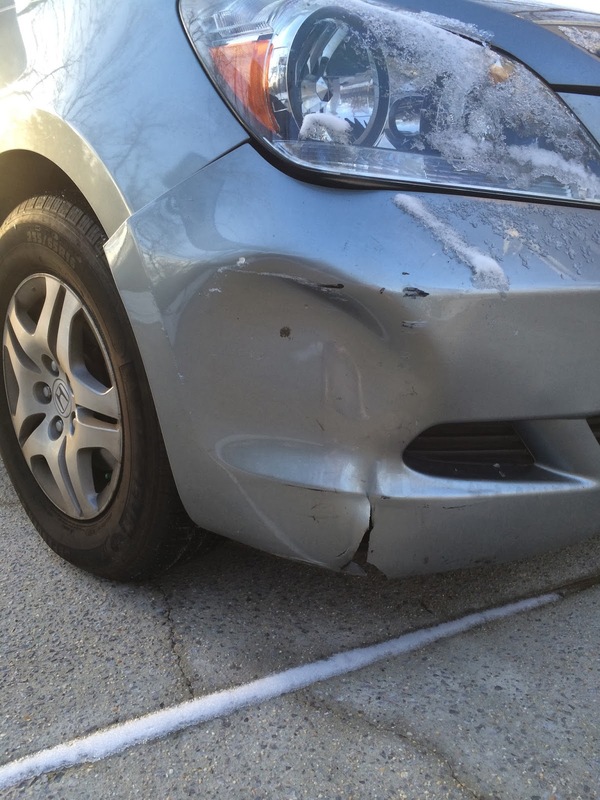 I'll need a new front bumper, and there are some scrapes on the right front quarter-panel. But overall, we have a great deal to be thankful for. 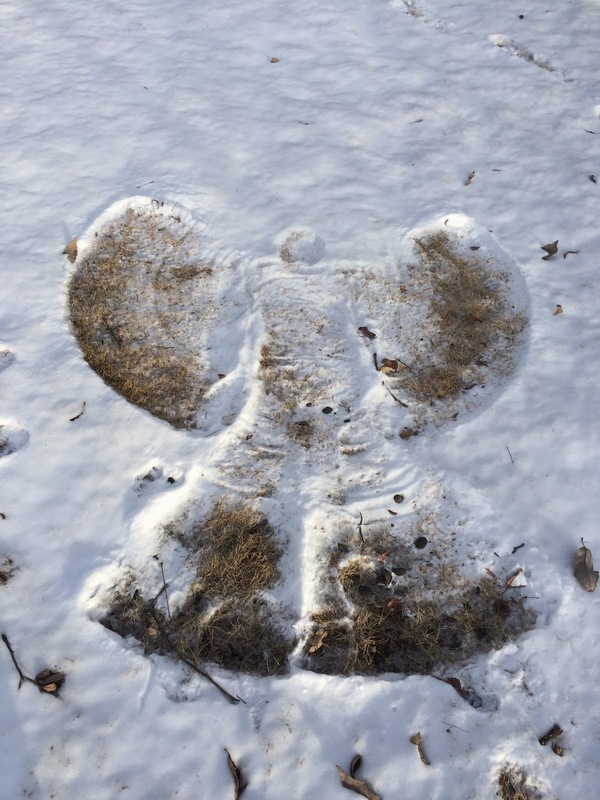 Nathaniel helped remind me of that by making a beautiful grass angel in our yard. Grayson had toyed with the idea of trying to drive home for hours on Wednesday -- an idea I argued strenuously against -- and he finally decided to try it. 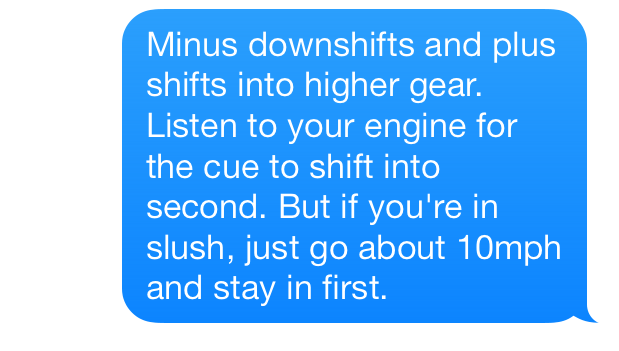 I said, "Just keep your car in first gear. Not in Drive, first gear. And don't call me or text me unless you actually have to pull over and abandon your car to walk home." LAWSY MERCY, INTERNET. This was why I wanted them to stay at daycare. As it turned out, they were only able to make it to within about two miles of the house before the road was blocked by abandoned cars and Grayson had to pull over. He left his car in the Target parking lot, bundled my baby up in two blankets and set out to walk the rest of the way home in the 18-degree air. Again, would staying at the daycare center where there was a roof, heat, blankets, hot food, diapers, wipes, TV, kids' DVDs and toys made more sense? OH, I DON'T KNOW. A woman took pity on them, picked them up and drove them about a mile before she couldn't go any farther. Then a man picked them up and drove them another half mile before he had to turn around because he couldn't go any farther. Finally, another man picked them up and drove them the rest of the way home. Grayson will tell you, the moral of the story is to always be sure to carry a cute child who is way underdressed for and yet totally exposed to the elements. So by Wednesday night, we were all together again. Even two more Snow Days couldn't steal our sparkle. All is right with the world, and we are so grateful that we have each other.